When’s the right time to involve design? Most organizations have caught on to the fact that design is more than just an art for making things look pretty. Gone are the days (for the most part, at least) of bringing the designer in at the last minute to put a shiny coat on things and make the buttons look nice. But some companies still struggle with knowing exactly when is the right time to bring design into the process. After all, is adding one or two more people to an already crowded strategy session going to hurt or help? We found that when it comes to design, it definitely helps. 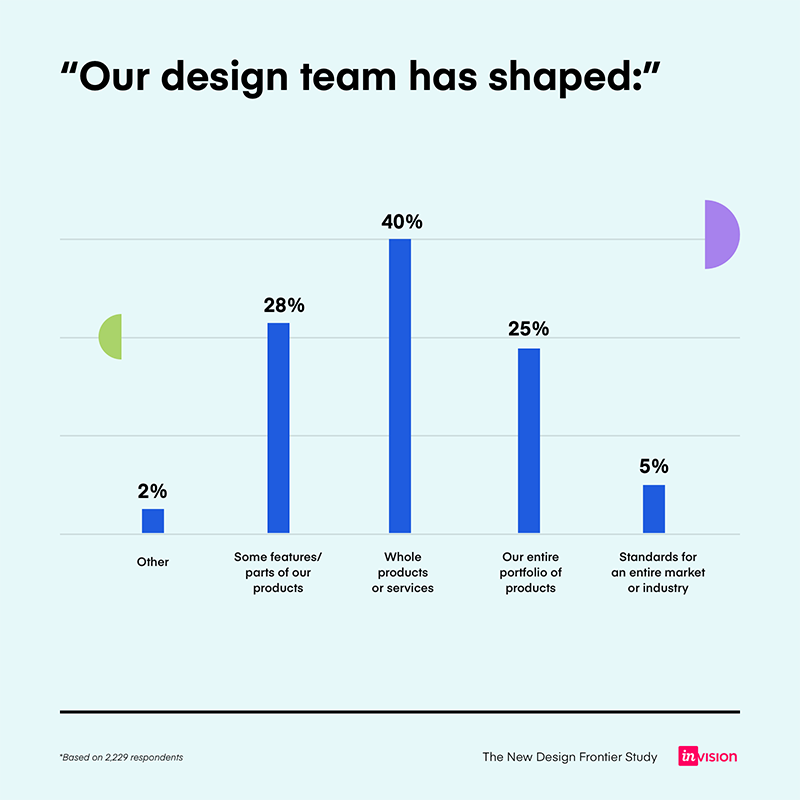 In Fall 2018, InVision surveyed designers from more than 2,200 organizations around the world to explore how companies can create better business outcomes with design. We used this data to map design-forward characteristics across five maturity levels (with Level 5 being the most mature) and found that design propels substantial business impact. In fact, companies with high design maturity in our model are more likely to see cost savings, revenue gains, productivity gains, speed to market, and brand and market position improvements through their design efforts. So what’s that right time to involve design? From talking to the companies with the highest maturity level, it turns out it’s from the very start. We found that when design takes center stage, it can have a meteoric impact on tangible business results, like revenue, valuation, and time to market. 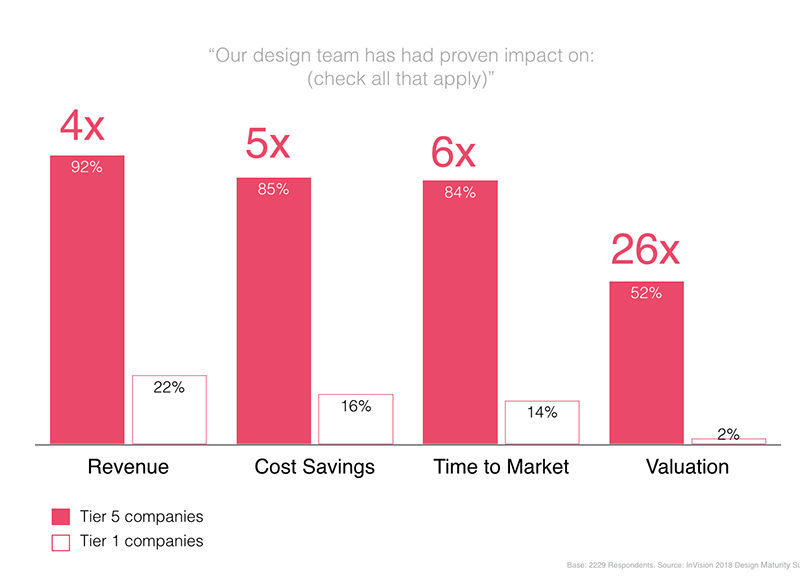 Design’s impact on revenue is undeniably positive. Design is well-integrated into the product development process, with the senior team, and in the product roadmap among the most design-forward organizations. In fact, there is a direct correlation between the number of business benefits that design drives and the degree of organizational adoption of design. The more an organization embraces and integrates design practices, the more positive business outcomes it sees, including when it comes to product, position, profit, and more. Fewer than a third of companies use design to merely work on features. Instead, design is reshaping product development and corporate portfolios at nearly 70% of companies. These teams are involved in key activities like trendspotting and foresight, product market fit tests, vision artifacts, and cross-platform strategies. Design has a seat at the senior table, and is included in strategic discussions. Design is well integrated into every step of product decision-making and evolution at about two-thirds of companies. What really separates the most design-mature companies from others is design’s involvement in strategy. Design brings a unique lens to strategy through exploratory user research techniques, trends and foresight research that assess product-market fit, and the delivery of unified cross-platform strategies. As a result, the most design-mature companies report that design has impact on the widest range of benefits, from employee productivity to growth in market share to the development of new intellectual property. Interested in learning more about the levels of design maturity and how your company can level up? Check out the full report. Want to learn more about design’s business impact?